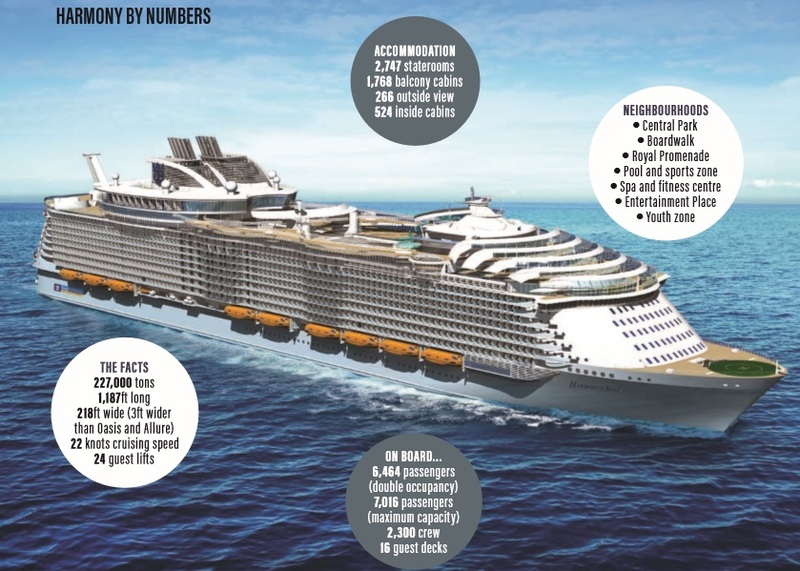 FIRST THERE WAS OASIS OF THE Seas, the world’s biggest cruise ship when launched in 2009. Capable of carrying as many as 6,360 passengers, plus 2,164 crew, she brought a revolutionary new design – balcony cabins looking into the middle of the ship and its Central Park and Boardwalk areas. One year later, along came Allure of the Seas, designed to be just a fraction longer so that its captain could claim that he was now in command of the biggest cruise ship on the seven seas. Otherwise, the two vessels were almost identical. Now it’s 2016, and a third Oasisclass ship is being launched. Harmony of the Seas is just over a foot longer than her older sisters, but that’s not the only difference. Six years’ experience of operation have given Royal Caribbean International an opportunity to make a few changes, improving things here and there. And they have been able to bring in new features from the Quantum class ships, which were undreamed of when Oasis was introduced. 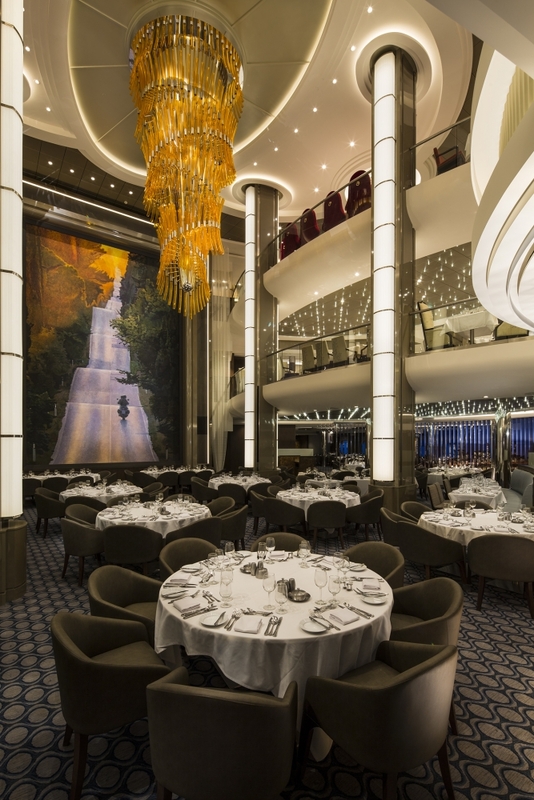 Her older sisters were built in frosty Finland, but Harmony – and the next ship in the class, still dubbed Oasis 4 – come from a shipyard in St Nazaire and have a little French joie de vivre about them. 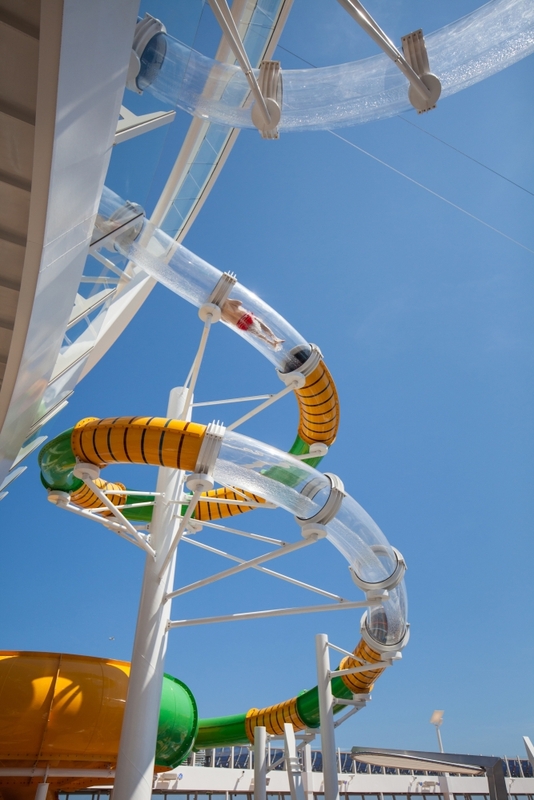 What’s more, there are features on Harmony completely new to any Royal Caribbean ship – not least of which is the fearsome Ultimate Abyss, the longest and scariest slide at sea. 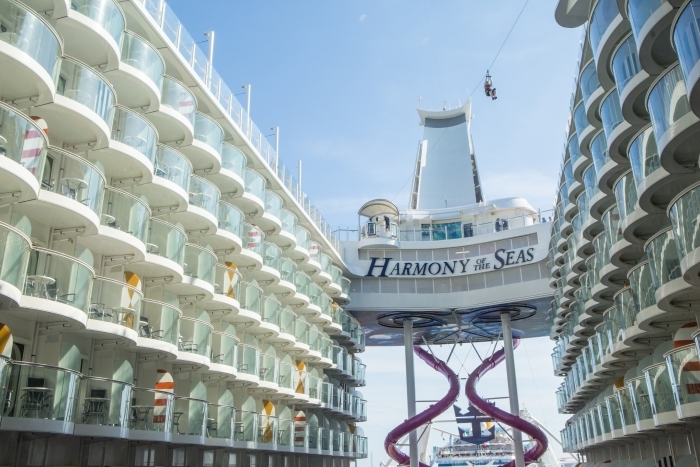 Here’s our guide to everything you need to know about Harmony of the Seas. If there’s anything you think we have missed, email editor@ worldofcruisingmagazine.com and we’ll do our best to find the answer to your questions. Here you’ll find 10,587 plants, 48 vines and 52 trees, plus speciality restaurants, a café serving the best roast beef sandwiches, and lboutiques. Harmony’s park has been adapted slightly to reduce the number of steps that could trip up the unwary. Fun for the family , with an authentic fairground carousel, Johnny Rockets burger bar, a Mexican cantina, sweet shops and everything a seaside holiday is all about. Displays of daredevil skill as Olympic-class divers plunge from more than 30 feet, accompanied by synchronised swimmers. Not everyone sees the appeal of drinking in a giant boat-shaped lift but it always seems a popular venue. 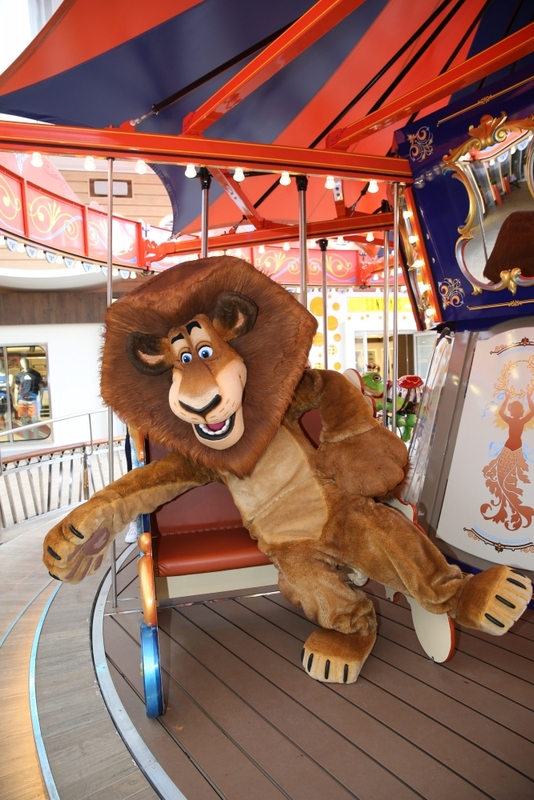 Characters from Shrek, Kung Fu Panda and Madagascar liven up street parties in Harmony’s Royal Promenade, and they make exciting company at family character breakfasts. With their rustic food served on wooden planks, Jamie Oliver’s casual restaurants have proved as popular on the Quantum class as they are on Britain’s high streets. Once dismissed as a gimmick, the robot barmen are beginning to prove themselves. I challenged them to mix a Captain Greybeard cocktail on Ovation of the Seas, and if you can stomach a concoction that includes Captain Morgan rum, Grey Goose vodka and Jack Daniel’s, topped up with Diet Coke, they have the recipe stored in their memory banks. Unexpected flavours, surprising presentation – all the tricks worthy of a Masterchef final are served nightly in Wonderland. It’s best to allow the waiters to choose for you, and don’t be deterred by the bite-sized servings early in the meal – you’ll eventually get to substantial portions. Unique to Harmony is Ultimate Abyss, the tallest slide at sea, created by the people behind the slide at the Orbit Tower in London’s Olympic Park. On this scariest of helter-skelters, riders plunge and twist through 11 storeys from Deck 16, 150 feet above the waves to emerge on the Boardwalk. For younger cruisers, Splashaway Bay will be a vibrant waterscape with sea creature water cannons, winding slides, a gigantic drench bucket and a multi-platform jungle-gym. Grease, the West End and Broadway hit musical, will debut on Harmony in a slightly abridged version, while Columbus the Musical is an original production that will have all ages chuckling.